My pantry and cabinets are stocked full of all types of baking supplies to make lots of different types of desserts. I’ve rounded up a few of my favorites for you here. I use two types of mixers in my house. 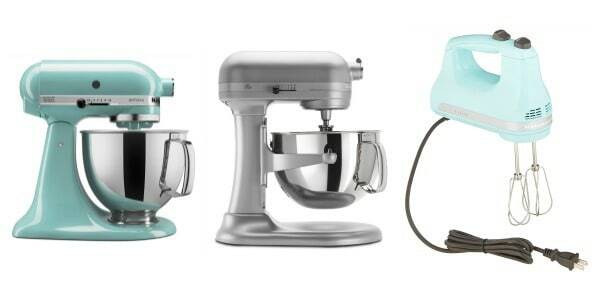 Stand mixers and hand mixers. For stand mixers, I have both the 5 quart stand mixer and 6 quart professional series mixers. The 5 quart mixer does the job for almost everything except large batches of frosting and cookie dough. For those I use my 6 quart mixer because it has more power. My hand mixer I use for things like cake mix and quick mixing recipes that don’t require a creaming method for preparing. I can’t live without my silicone baking mat s. At first I wasn’t really a believer until I purchased some myself. Now, I wouldn’t ever bake without them. They are non stick, and easy to clean. The added layer between your baking sheet and whatever you are baking, helps prevent them from burning. This can be used for more than just cookies! I always use these when I am dealing with caramel or melting chocolate since it is so easy to get it off of there! Recently they added 8-inch round and 9-inch round mats to their lineup. I’m obsessed. Once I started using my EatSmart Digital Kitchen Scale to measure my flour and sugar, I found the results were much more consistent. I use the tare function so I just put my mixing bowl on top and measure right into the bowl. It’s thin and about the size of my hand, so it’s really easy to store. It has several setting to measure with as well. The key to good baking is good bakeware. 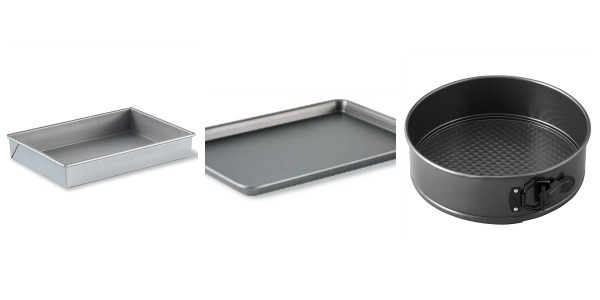 I have tried a lot of different brands, and lot of different types of baking pans, but I have a few that I just love. I reach for my Calphalon Nonstick Cake Pan- 9 by 13-Inch first. I think this pan in particular because the sides are straight, whereas most 9×13″ pans are rounded on the bottom corners and tend to be angled. This makes the edges of your cake a lot straighter. This is my go-to sheet pan for cookies. 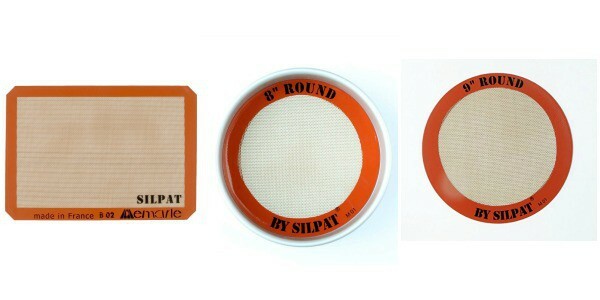 My Silpat fits perfectly inside the Calphalon 12-by-17-Inch Nonstick Jelly Roll Pan. I have a couple of these and use them for baking cookies, roasting veggies, pretty much anything! I use my Calphalon 9-Inch RoundSpringform Pan way more that I ever thought I would. It is perfect for all my no-bake cheesecakes and dessert lasagnas! The most common pan I use for cakes is my 8-inch aluminum baking pans. Almost all my layer cakes call for 8-inch cakes. These are nice and tall (3 inches to be exact). I know most kitchens have 9inch pans, but I never really use these. Most bakeries do cakes in 6, 8, 10 & 12 inches. You guys know I make a lot of cupcakes. I did a test to see how different pans produced different results and I found that darker, nonstick pans tend to help produce a taller cupcake. Check out my cupcake research post. 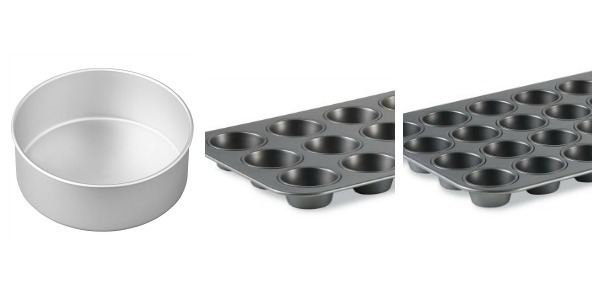 I have both a dark, nonstick Calphalon 12-Cup Nonstick Muffin Pan and a few of these Wilton cupcake pans as well. Once I found my Calphalon 24-Cup Nonstick Mini Muffin Pan, I never looked back. I discarded all my other mini muffins pans. These are taller than most mini muffin pans, which are perfect for all my cookie cups! Mini cupcakes are totally cute, but I find the bottoms usually aren’t even because the bottom of the pan is curved. Well this Calphalon pan is straight on the bottom which helps make the perfect mini cupcake too! I always use my cookies scoops when baking cookies and cupcake. Using a cookie scoop helps ensure even dough, which means consistent baking time. Since these are dishwasher safe, it is that much easier to clean up! I have small, medium and large cookie scoops. Surprising, my Candy Thermometer comes in handy more than I would have thought. It is essential for making Swiss Meringue Buttercream or homemade donuts. It’s also great for homemade caramel and melted chocolate. I didn’t even realize how inexpensive they are! If you like making streusels or homemade crust, the OXO Good Grips Dough Blender is essential. It makes cutting the butter into the flour that much easier. Then pop it in the dishwasher. Easy peasy. 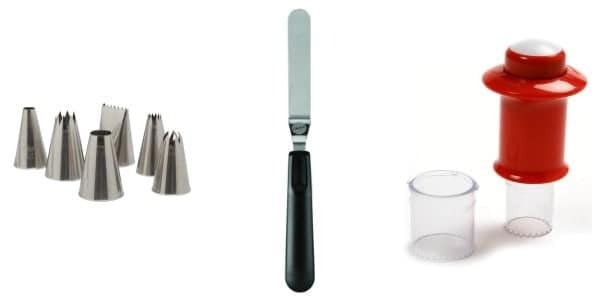 When I started making homemade bread and scones, I started using my OXO Good Grips Scraper & Chopper. It cuts through dough with ease, and can also help clean your work space. This is also referred to as a bench knife. Side note, I all use this to help smooth out the edges of my cakes! You know how much I love cupcakes, so I had to be sure to include some of my favorite things for your favorite cupcake and cake baker. I hardly ever use regular food coloring anymore, especially when it comes to frosting. AmeriColor Gels are much thicker than traditional food coloring, which means it won’t thin out your frosting. These can be difficult to find if you don’t have a cake store near by, but I have found that you can buy them from Sur La Table as well. You can buy them as individual colors or as a set. This is the perfect starter set. AmeriColor Soft Gel Paste Food Color, Junior Kit-8 assorted colors,0.75 oz bottles. Wilton also make a Color Right Color system with is 8 basic colors that can be combined to make tons of different colors and shdes! I am very excursive about the piping bags I used. People always ask me how I frost cupcake so well. You can read my tutorial here. I insist that have large piping bags is essential. Filling a large bags means that you can proper position your hands when piping. They need to also be durable. I hate refilling bags, so I use large ones. I also refuse to clean them, so they have to be disposable. My favorite brand are these: 18″ Disposable Pastry Bags. 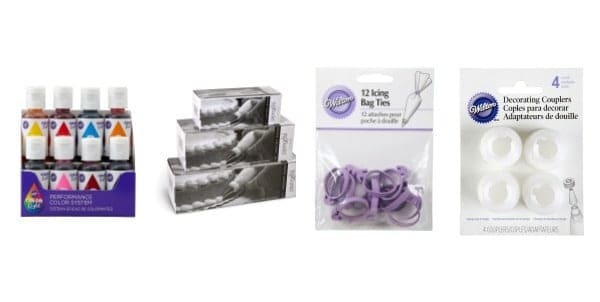 Sometimes you aren’ t ready to pipe right away, so these Wilton Icing Bag Ties are tiny rubber bands that will help secure your bag closed. This is especially important for royal icing. If you are using small tips, you will need Wilton Coupler Set, Set of 4. This allows you to easily change out the piping tips you are using without changing the piping bags. Ateco 6-Piece Pastry Tube and Tips Set is a great starter set. I also have specific ones I list in my tutorial. I have several sizes of offset spatulas. I use the Wilton Angled Icing Spatula, 9-Inch the most. It’s helpful for frosting cookies, cakes and cupcakes. It helps to keep your hand from dragging in the frosting! Anytime I make a cupcake with a filling, I use my Norpro Cupcake Corer, Red. There are two sizes of corers so you can choose how much of the cupcake you want to remove. The ejection button on the top helps clear out the corer quickly. I never decorate a cake with my Wilton Trim ‘n Turn Plus Cake Turntable. It helps me turn the cake as I decorate and elevates it off the counter. Sure you can level your cakes with a knife, but unless you are a pro, I doubt they are ever truly straight. 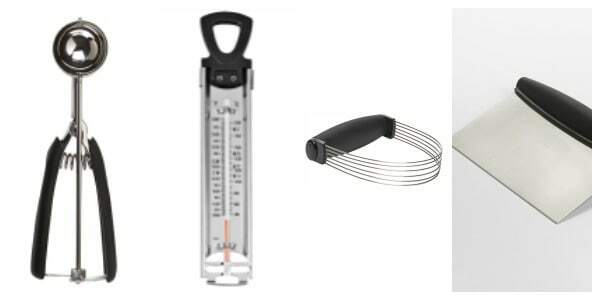 The Wilton Decorate Smart Small Cake Leveler is inexpensive and effective! There are several different heights you can set this to depending on how tall or short you want to level your cake. 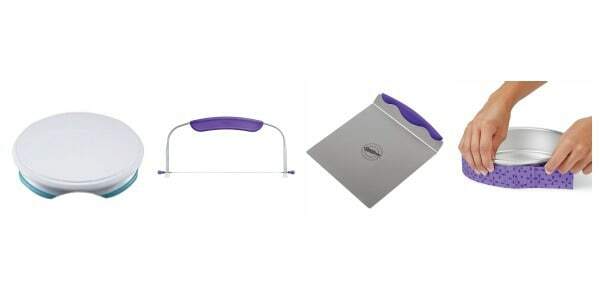 When I make cakes, I also reach for my Wilton 2103-307 Cake Lifter, 8-inch. It helps the cake from breaking apart and makes transporting the layers really easy! Lastly, I bake all my cakes with bake even stripes. This helps make a nice and even topped cake therefore reducing the amount of cake wasted due to the dome it creates when baked. I get lots of questions about where I buy my cupcakes liners and sprinkles from. All of my cupcake liners and some of my sprinkles come from Shop Sweets and Treats. They make a thick, grease-proof cupcake liner, which means that when baked, the liner stays nice and bright, even with a chocolate cupcake! There are certain restrictions with these such as storage. 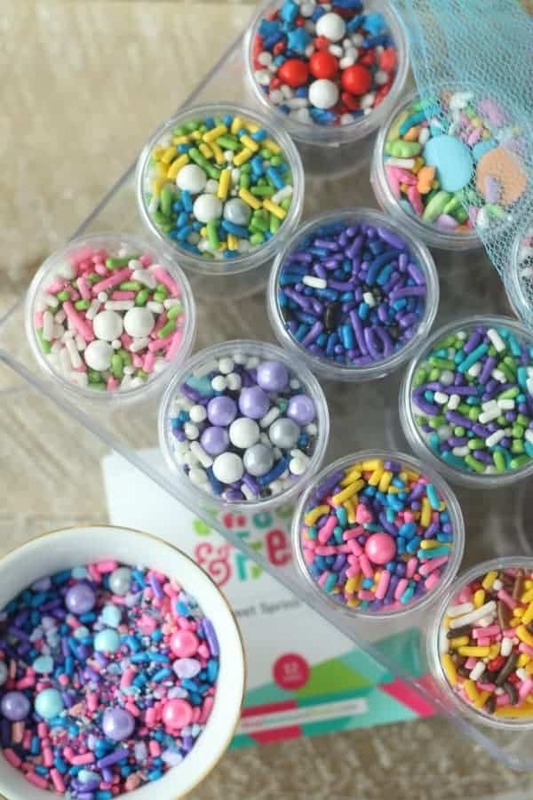 I also love Sweetapolita sprinkles. Last but not least, I can’t tell you how much I love my OXO Good Grips POP 4-Quart Storage Container . I recently overhauled my pantry and replaced my large glass canisters of flour and sugar with these OXO POP Storage Containers. They hold a good amount of flour or sugar and since the opening is wide, I can dip my measuring cup right in! Plus I know it’s sealed when I pop to the top down! Please note this is not a sponsored post. I own and use each and every one of these items. This post does contain affiliate links. Throughout various posts on this blog, you will find affiliate links for sites such as Amazon and other online retailers. Beyond Frosting is a participant in the Amazon Services LLC Associates Program, an affiliate advertising program designed to provide a means for sites to earn advertising fees by advertising and linking to Amazon.com or affiliated sites.